MC Ranch is one of the most successful and progressive breeders of Santa Gertrudis cattle. Since 1992 MC Ranch has bred and exhibited as many champions as any breeder competing today. MC Ranch can provide you with quality cattle whether it be the highest quality show prospects or pasture proven genetics that will put you one step closer to your Santa Gertrudis or commercial goals. MC Ranch is located in the scenic northwest Georgia foothills. The ranch has been family owned and operated since the 1830’s. 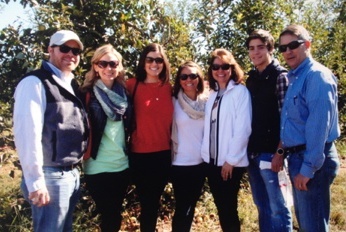 MC Ranch is currently owned and operated by Dr. Burton and Judy McDaniel and their four children Wes, Ali, Anna, Will and their familes. MC Ranch began raising Santa Gertrudis influenced cattle in 1970’s and exhibiting Santa Gertrudis cattle in 1990. MC Ranch exhibited their first National Champion Female, MC Scarlet in 1992. MC Scarlet went on to be the cornerstone of MC Ranch’s breeding program for the next twenty five years. Through selective and methodical use of line breeding MC Ranch has bred and exhibited numerous National Champions Females and Bulls. Most recently the 2014 National Junior Grand Champion Female was bred by MC Ranch and exhibited by Will McDaniel. However, MC Ranch‘s greatest honor was earning the Santa Gertrudis Breeders International Breeder of the Year Award 5 years in a row (1994-1998). While proud of all their accomplishment in the show ring, MC Ranch recently turned their focus toward the integration of NuGen genetics into their herd. MC Ranch is partnership in the project with Wendt Ranches and Goodin Farms. The NuGen Partners have successfully reproduced the (3/8 x 5/8) foundation animal, using the best available genetics from the Brahman and Shorthorn breeds. The NuGen foundation animals are purebred Santa Gertrudis equivalent to SGBI foundation sire “Monkey.” All offspring out of the NuGen foundation animals are purebred Santa Gertrudis. NuGen cattle offer Santa Gertrudis breeders the opportunity to benefit from increased hybrid vigor and heterosis when crossed with other Santa Gertrudis animals. NuGen cattle were developed to exceed the current demands of the beef industry. MC Ranch is actively involved in both Santa Gertrudis Breeders International and the National Junior Santa Gertrudis Association. Dr. Burton McDaniel served on the SGBI Board of Directors for twelve years and Judy McDaniel currently serves on the SGBI Youth Activities Committee. Judy and Burton chaired the 2012 SGBI Annual Meeting in Chattanooga, Tennessee; 1995 National Junior Heifer Show in Perry, Georgia; and biannual GOALS adventures across the country. Wes McDaniel is a former President of SGBI and the National Junior Santa Gertrudis Association. Both Ali McDaniel and Anna McDaniel served as Queens of the National Junior Santa Gertrudis Association. Anna served as the 2008-2009 National Junior Santa Gertrudis Association President. Will McDaniel served as the 2015-2016 National Junior Santa Gertrudis Association President. The McDaniel family is fully committed to the success of the Santa Gertrudis breed.